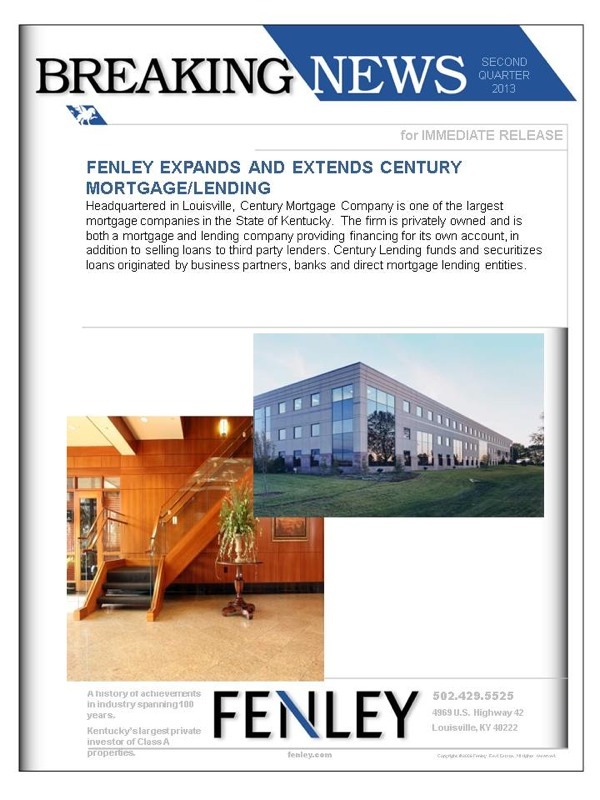 Headquartered in Louisville, Century Mortgage Company is one of the largest mortgage companies in the State of Kentucky. The firm is privately owned and is both a mortgage and lending company providing financing for its own account, in addition to selling loans to third party lenders. Century Lending funds and securitizes loans originated by business partners, banks and direct mortgage lending entities. 07.31.18 - Fenley Extends John Gore Theatrical Group, Inc.
03.07.18 - Fenley Signs Modine Louisville, Inc.
02.15.18 - Fenley Extends Black & White Design, Inc.
12.13.17 - Fenley Expands And Extends Norton Properties, Inc.
11.01.17 - Fenley Signs Tetra Tech, Inc.
10.17.17 - Fenley Extends Salem Media Of Kentucky, Inc.
09.01.17 - Fenley Expands And Extends Morgan Stanley Smith Barney Financing, Inc.
04.13.17 - Fenley Expands And Extends Norton Properties, Inc.
12.23.16 - Fenley Expands And Extends Comprehensive Health Management, Inc.
09.26.16 - Fenley Renews RXC Acquisition, Inc.
05.16.16 - Fenley Expands Norton Properties, Inc.
01.08.16 - Fenley Signs Norton Properties, Inc.
Third Qtr 2015 - Ashbourne Capital, LLC. Third Qtr 2015 - DMI Office Furniture,Inc. Third Qtr 2015 - C.H. Robinson Worldwide, Inc.
Second Qtr 2015 - Fenley signs Luvata Electrofin, Inc.
First Qtr 2015 - Fenley Signs AffiniCorp, LLCj, Geomomentum, Law Officer of Zach Taylor, Microsoft Corporation, Simon and Company PSC. 12.05.14 - Fenley Renews Witt/Kieffer, Ford, Hadelman, Lloyd Corp.
11.26.14 - Fenley Signs Tetra Tech, Inc.
09.17.14 - Fenley extends West Norwood, Inc.
03.13.14 - Fenley Signs Liquor Stores Usa South, Inc.
11.11.13 - Fenley Signs Coca-Cola Enterprises, Inc.
11.01.13 - Fenley Signs Black & Veatch Corporation. 10.31.13 - Fenley Signs Key Brand Theatrical Group, Inc.
07.03.13 - Fenley Signs Edward D. Jones & Co., L.P.
03.29.13 - Fenley Signs The Bristol Bar & Grille, Inc.
02.18.13 - Fenley expands Morgan Stanley Smith Barney Financing, Inc.
11.28.12 - Fenley signs Black & White Design, Inc.
09.07.12 - Fenley Signs DMI Furniture, Inc.
06.22.12 - Fenley Signs Greater Louisville, Inc.
06.18.12 - Fenley Signs Norton Properties, Inc.
06.04.12 - Fenley signs Witt/Kieffer, Ford, Hadelman, Lloyd Corp.
05.07.12 - Fenley Renews Norton Properties, Inc.
04.06.12 - Fenley Expands RXC Acquisition, Inc.
11.04.11 - Fenley Signs Caterpillar, Inc.
11.04.11 - Fenley Renews West Norwood Inc. and Psychiatric Associates of Louisville, P.S.C. 10.11.11 - Fenley signs Vogt Power International, Inc., a wholly-owned subsidiary of Babcock Power, Inc.
09.01.11 - Fenley Signs Tri-Arrows Aluminum, Inc.
08.31.11 - Fenley signs RXC Acquisition, Inc.
08.18.11 - Fenley signs Comprehensive Health Management, Inc.
06.13.11 - Fenley Signs Norton Properties, Inc.
05.16.11 - Fenley signs Morgan Stanley Smith Barney Financing, Inc.
08.26.10 - Fenley signs Luvata Electrofin, Inc.
07.21.09 - Fenley signs Supplemental Health Care and Zyquest, Inc.